Everybody loves ice cream but nobody likes frozen fingertips from eating ice cream straight out of the pint. Let’s face it, it’s 2008, who’s got time for a bowl? I surveyed my friends (and these are fully-grown, responsible, job-holding adults, mind you) and found a variety of solutions to this quandary. Some used a paper towel, others a dishtowel, and my personal favorite: oven mitts. [cue Dr. McCoy] Damn it, Jim, there has to be a better way! So I designed and crocheted The FROZYtm. It’s an ice cream/frozen yogurt pint cozy. 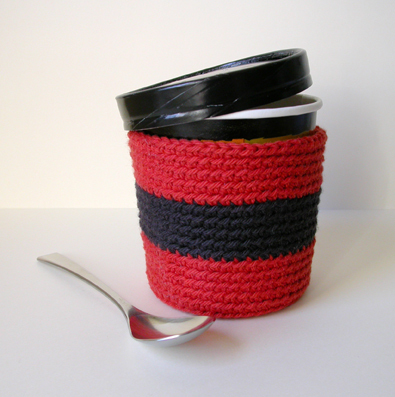 I used small, tight stitches to create a dense and absorbent cozy that will not only protect your fingertips but also absorb condensation from the cardboard pint. Say you’re in your pajamas, eating out of a pint of Haagen-Dazs Dulce de Leche. You’re watching, ironically enough, The Biggest Loser, and the phone rings. It’s you’re college roommate whom you haven’t spoken to in years. You put the ice cream down, pause the Tivo and chat for a few minutes. At some point it occurs to you that melting ice cream might not be great for your coffee table – no need to worry, The FROZY will take care of keeping your IKEA coffee table dry from the condensation -- because you don’t have to live in Versailles to care about condensation rings on your furniture. 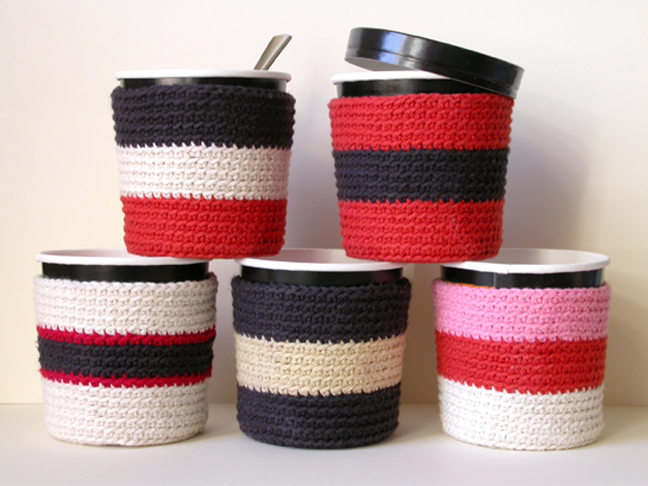 You’re probably wondering, what kind of time does she have to be crocheting pint cozies? Actually, my days are pretty full running a small business largely by myself, but crocheting lets me relax in front of the TV at the end of the day. So I get to watch the Invasion of Normandy and still have a nice project completed at the end of two hours. I’ll be the first to admit that it’s not rocket science but there’s something to be said for a stylish and civilized way of keeping your fingertips from freezing while you eat ice cream out of a pint, right? Check out my display at my etsy store. I started this blanket in June this year. 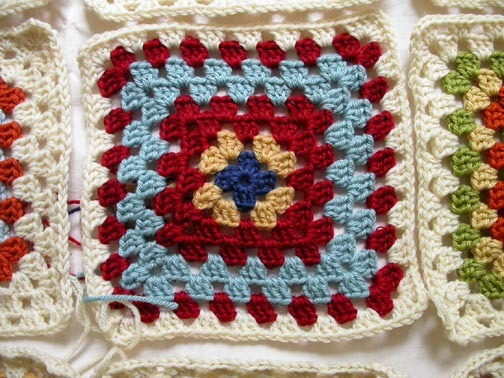 I wanted to keep crocheting through the warm summer months and working with granny squares is a great way to make progress without sitting with a lapful of wool. 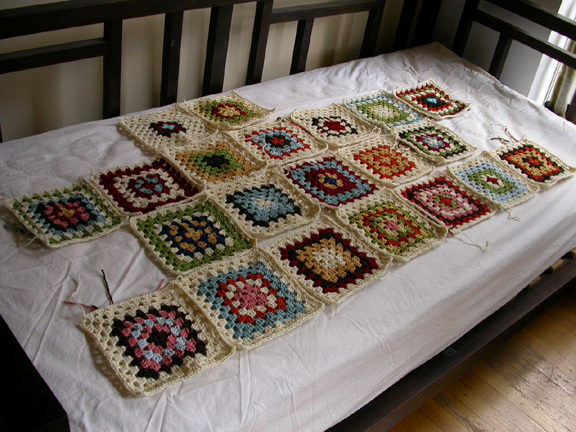 Each square has 8 rounds and once they are done I just put them away until I am ready to stitch them together. This first square is the one which served as the color inspiration for the rest of the squares. I wound up with about 8 or 9 colors that worked well together. I had to be very judicious in my use of color -- it's very easy to get carried away and the next thing you know you have op-art from the seventies. Initially I had planned on making a blanket to cover a twin bed but it has since grown to queen-size blanket. I am just four squares short of my goal -- 56 squares. Once the 56 squares are done, I'll be set to stitch them together. I'll arrange them on my bed and then take a photo and print it so I can have a handy reference and won't have to strain my memory trying to remember what square each square is next to. To finish off the blanket, I'm planning on a wide cream colored border to frame the center of the blanket. It's hardly an original idea -- I saw this blanket in an interior decorating book and was marked as a flea-market find. I also keep an eye out for interesting soft furnishings when I watch movies. For instance, Kathleen Kelly has a terrific quilt on her bed in You've Got Mail. There are wonderful blankets and quilts in the children's bedroom in Nanny McPhee. 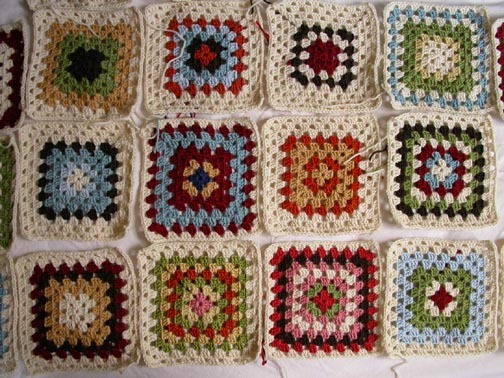 I'm looking forward to staying warm while stitching together my granny square blanket this winter. I love it when a plan comes together.